Bring Christmas cheer to your home this season with some fresh ideas for decorating your home! With minimal effort you can ensure that Santa and your guests will love the look of your home this holiday season. Decorating your home's exterior is much more than hanging lights. Make the extra step by adding some outside decor to your usual Christmas decorating routine. Use colorful Christmas Wreaths on white doors to provide contrast and beautiful texture to the outside of your home. 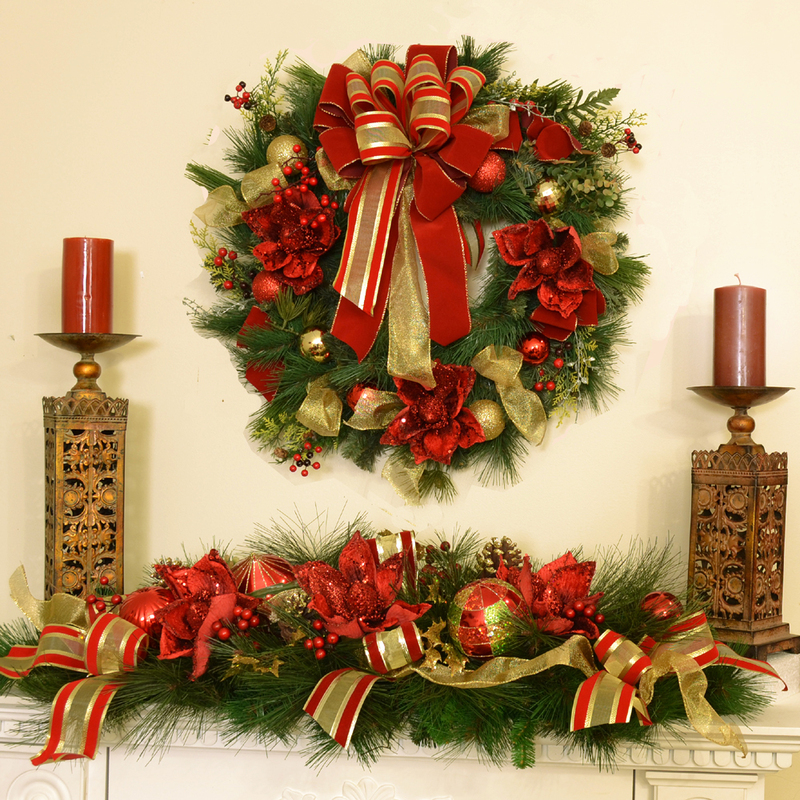 Floral Home Decor offers several Christmas Wreaths to choose from including several accented with bows that can add extra punch to your decor. You can even decorate the wreaths with twinkling lights to add an extra glow at night to welcome evening carollers and will also allow your decor to be seen from the street later at night. For many Christmas is a time for personal or religious reflection. Use candles instead of lamps to light your home to create the perfect mood. There are a wide variety of candles to choose from including several Christmas-inspired designs. Depending on your religious beliefs you can also arrange several candles to make an advent-inspired wreath. Candles are a great addition to your Christmas decor and will provide a classic, relaxing environment for you and for your guests. Floral Home Decor offers our holiday mailbox swag with a bow that will add the perfect outdoor look to your home’s mailbox. Our mailbox swag is easy to attach and ready to stand up to whatever winter has to offer. Our mailbox swag is finished off with a red velvet gold edged bow. It's the perfect addition to your home and will add a lot of Christmas cheer to your home's exterior. You can do it yourself by wrapping sheer ribbon loosely around a pine garland and drape the garland around your mailbox. You can also add a big bow that is sure to be eye catching. Your Christmas tree doesn’t have to be the only natural element that you bring inside for your Christmas decorating. Add some greenery to your fireplace mantle by layering with lushness. Use a thick layer of garland at the top of the mantle and weave ribbon tails throughout. Floral Home Decor’s mantle decorations include pinecones, berry branches and various shades of greenery for the perfect texture. You can also include outdoor elements specific to your geographical location for extra decor. In many cases tradition is better than new when decorating your home for Christmas. This is especially true when hanging ornaments on your tree. There’s no need to hand new ornaments every year. Adding ornaments is perfectly fine but reusing Christmas ornaments is a great way to keep traditions alive. Your children will love returning home for Christmas and seeing ornaments they made in grade school still hung on your tree. Friends and family who gave you ornaments as gifts will also love seeing them on your tree.